Have you ever had to grit your teeth and “hang in there” while one of your holdings works through an industry trough? That’s where we’ve been at with USA Compression Partners LP (USAC) for the past few quarters. 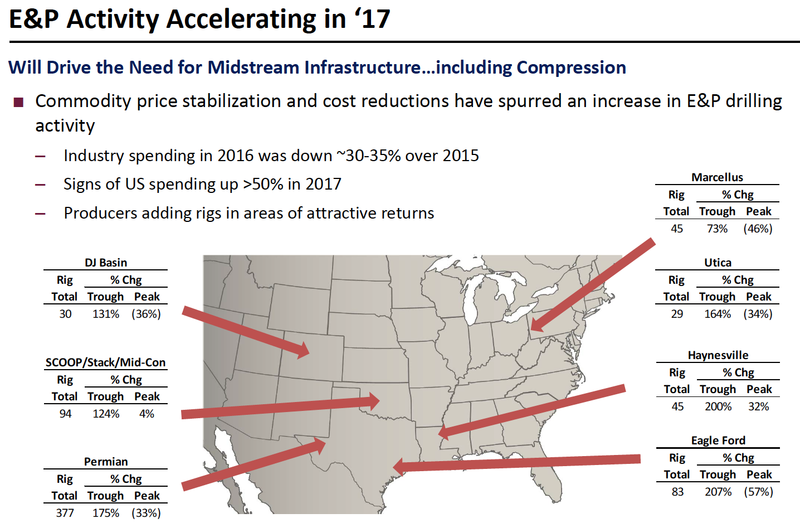 As US drilling declined and picked back up, USAC, the leading US pure play compression company, has seen its DCF and distribution coverage falter due to a lagging effect – new compression demand tends to lag increased drilling by a few quarters. Its price/unit also suffered. Management reaffirmed it’s 2017 guidance on the Q2 earnings release. We’ve updated this table with the actual distribution figures from Q1-Q2, to compare them to the guidance figures. If USAC maintains the current level of total distributions, their traditional DCF/Distribution coverage will be in a range of .84x to .95x, according to the DCF guidance range. 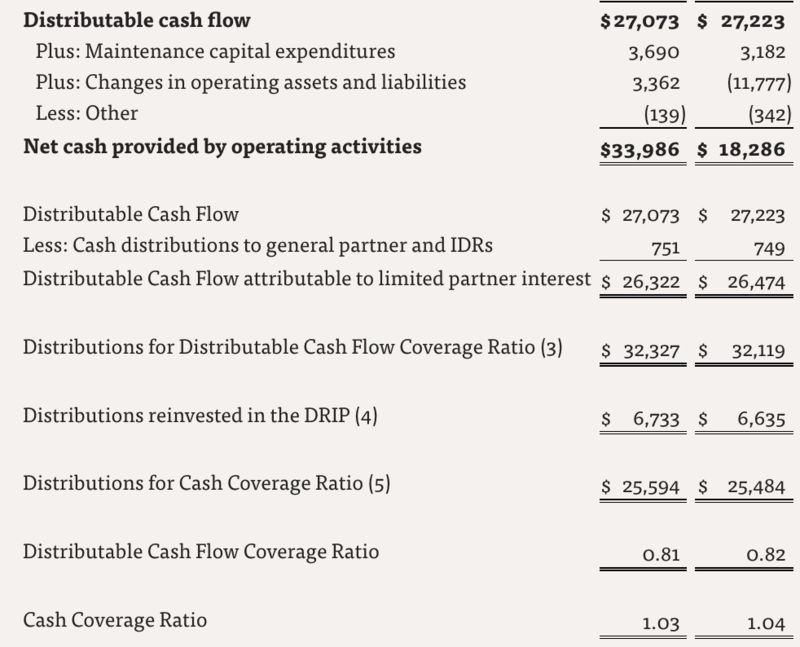 However, if their GP continues to reinvest its distributions in Q3 and Q4 ’17, USAC’s cash distribution coverage ratio will be in a 1.06x to 1.20x range. 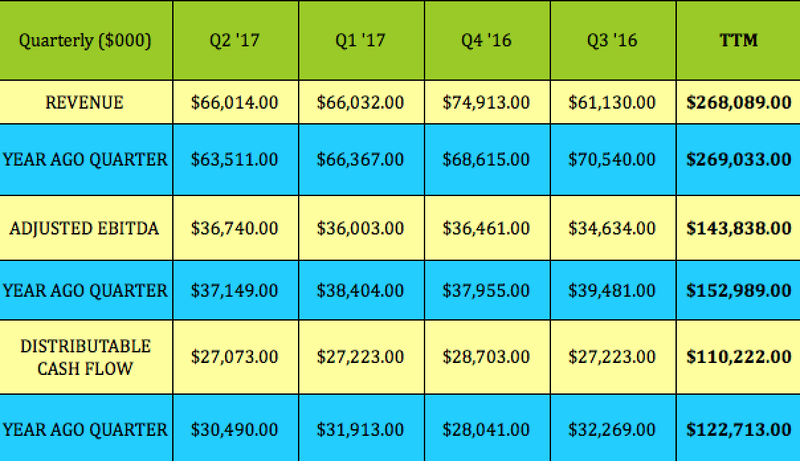 In this table, we compare the actual Q1-2 ’17 EBITDA and DCF figures vs. the pro-rated 2017 guidance figures. So far in 2017, management has achieved the low end of its guidance in both DCF and EBITDA. However, there are reasons to believe that this will improve in the second half of 2017 and in 2018, which we’ll detail in the Earnings and Back To The Future sections further on in the article. 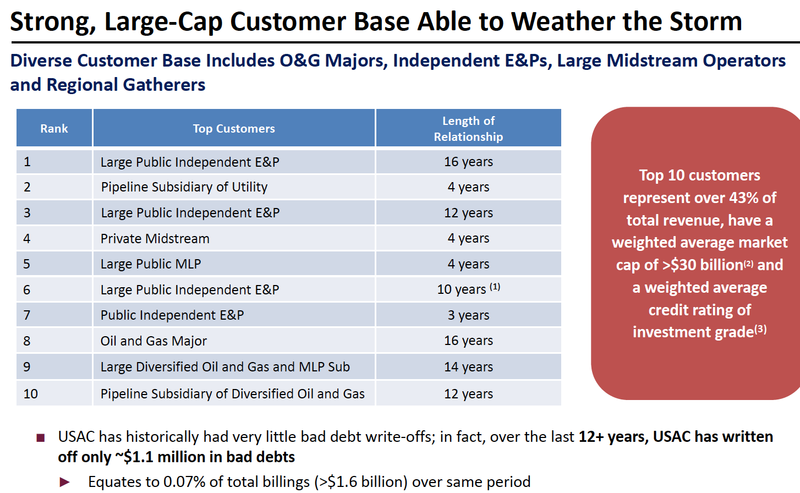 USAC’s next distribution should have an ex-dividend date sometime in late July. It pays in the usual Feb/May/Aug/Nov LP cycle. Management has maintained a $ .525 quarterly payout since August 2015, which is 23.53% above its targeted minimum quarterly distribution. You can track USAC’s price and current yield in the Basic Materials section of our High Dividend Stocks By Sector Tables. Unit holders get a K-1 at tax time. Note: Investing in LPs and MLPs may present tax complications when done in an IRA. Additionally, since LPs usually make tax-deferred distributions, you’d reap more tax benefits by holding them in a non-IRA account. At any rate, please consult your accountant about this issue. We feature option-selling trades for USAC in our premium subscription service, which we can’t reveal here, but you can see details for over 25 trades in our free Covered Calls and Cash Secured Puts Tables. OK, so DCF was down due to increased demand – not a totally negative scenario – they needed to spend to prepare more machinery for future service. 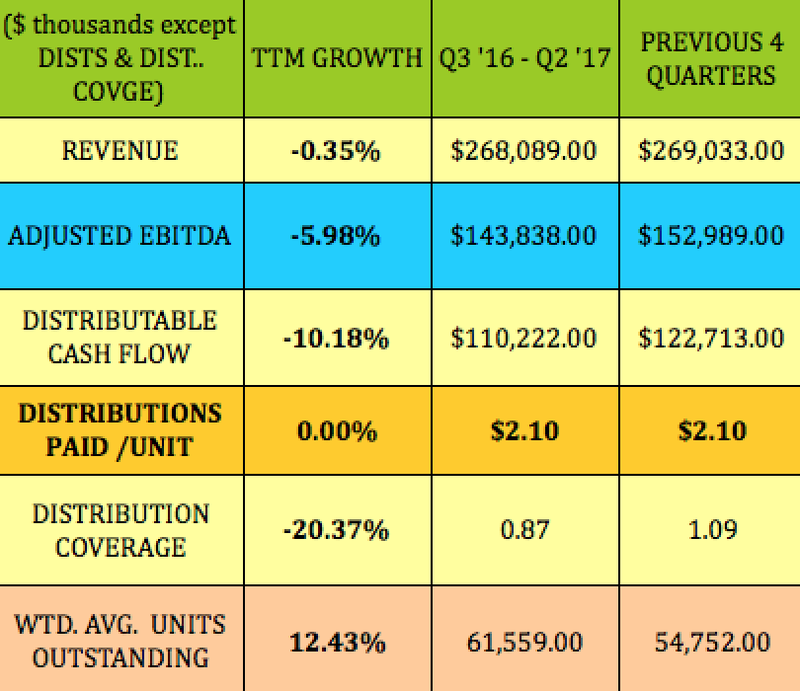 Here’s what investors have had to deal with over the past 4 quarters, in return for receiving the steady $ .525/unit quarterly payout – flat revenue, EBITDA down -6%; DCF down -10%; DCF Distribution Coverage down -20%; and unit growth of 12.43%. We wouldn’t be braving these headwinds over the past year if it wasn’t for management’s long-term track record of growth – EBITDA CAGR of 15%, Revenue CAGR of 16%, with margins above 50%, (and, of course, the steady distribution). 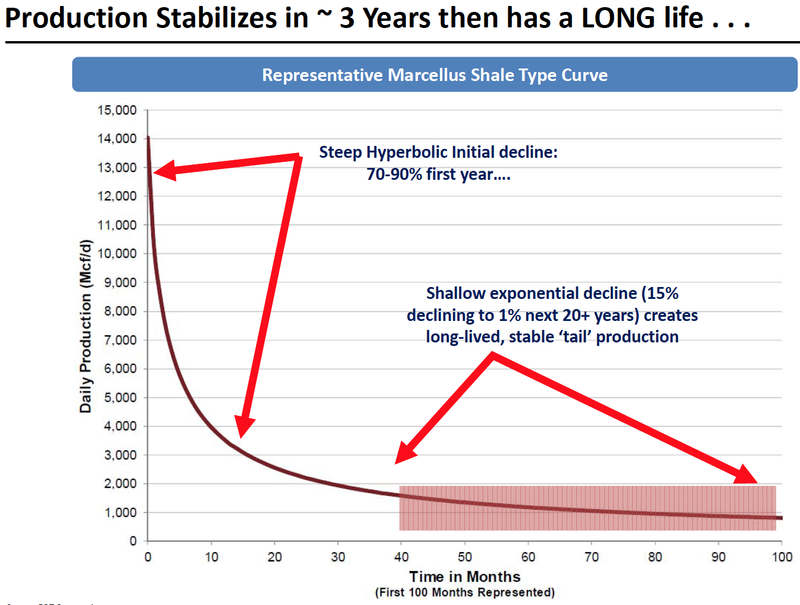 Another factor which makes compression services “sticky” over the long term is the profile of natural gas wells in shale plays, which not only need more compression but also tend to have a long 20-year-plus life, after stabilizing. 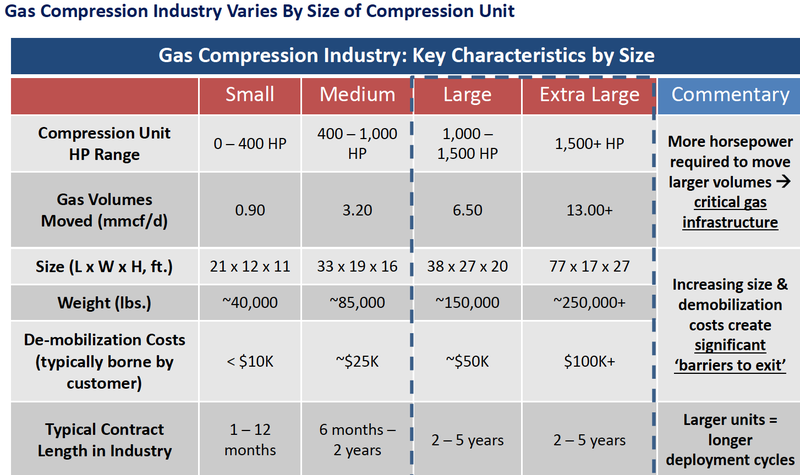 What’s causing the increased demand for compression? US producers are adding rigs in key areas – excepting the Marcellus, which was up 73% from the trough, all of the areas listed below had rig counts up by triple digits as of 8/11/17. 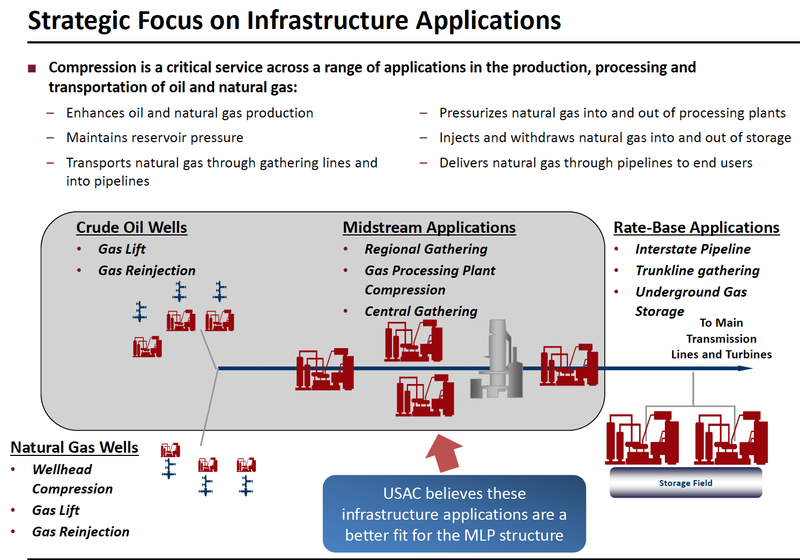 As we noted earlier, USAC isn’t currently covering its distributions in a traditional DCF/distribution model – its general partner, USAC Compression Holdings LLC, has been supporting the distribution by electing to reinvest 50% of its distributions into the company’s DRIP plan, which affords USAC more cash to continue paying out that $ .525 distribution every quarter. If the general partner decides to stop reinvesting in the near term and USAC’s anticipated earnings growth doesn’t emerge, management may be forced to cut the distribution. USAC is now 12.6% below analysts’ current $ 17.60 price target, and 28% below the $ 20.00 high price target. 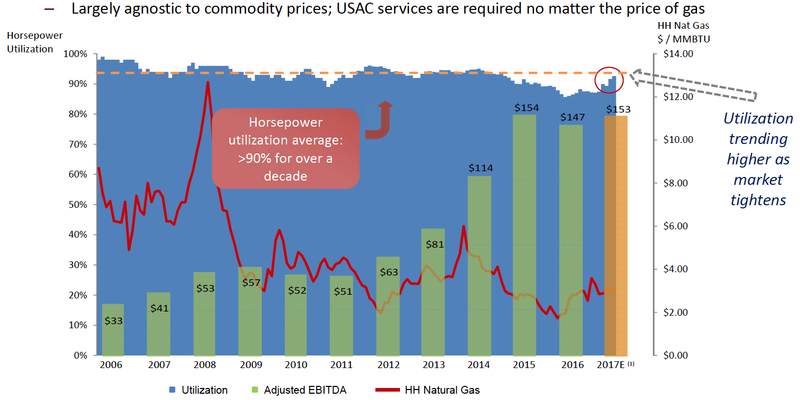 USAC’s 13.44% yield dwarfs the Oil & Gas Equipment & Services industry’s average 1.67% yield, while its Price/Book is considerably lower. The industry isn’t known for high ROA and ROE figures – the amount of heavy equipment needed implies a large depreciation and amortization charge vs. net income, which makes USAC’s tiny ROA and ROE figures look good by comparison. 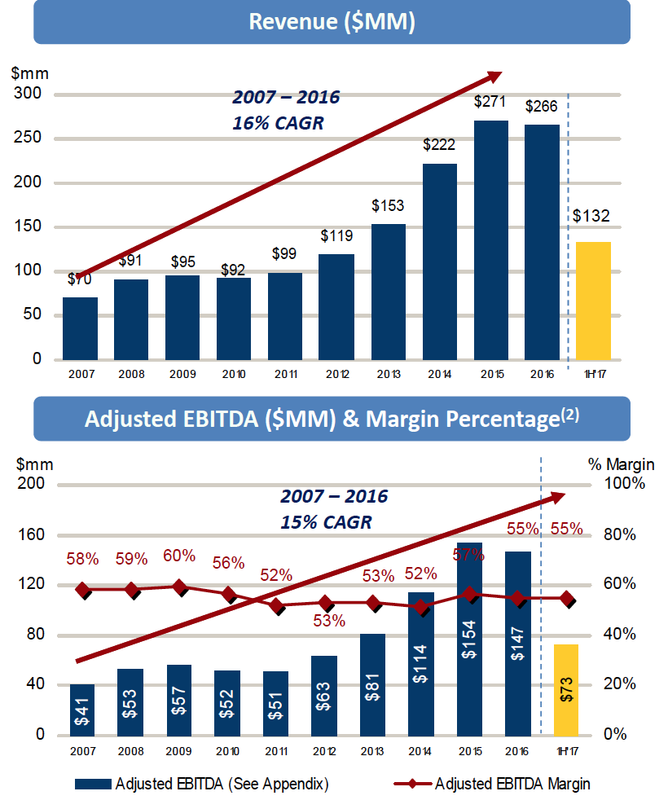 Its Operating Margin is also much higher than broad industry averages, while its Debt/Equity level is much lower. 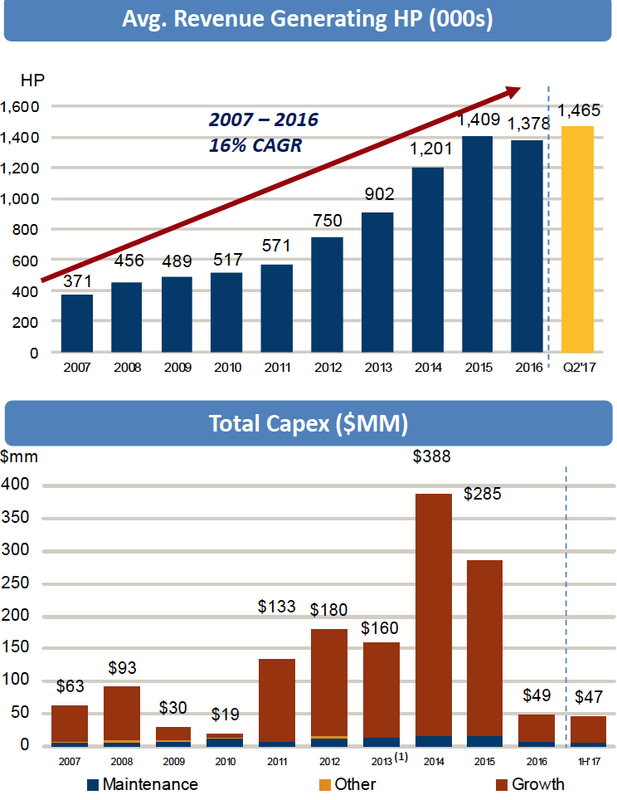 The $ 1.1B credit facility matures in 2020. They had ~ $ 375M available as of 6/30/17. We continue to rate USAC a long-term buy. 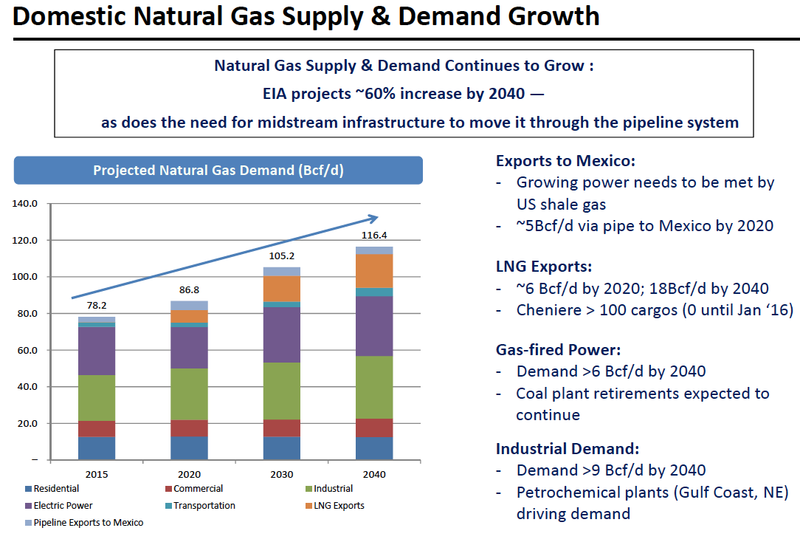 This is a company which has weathered numerous Energy cycles, and we feel that they will do so once again. Meanwhile, income investors receive a very attractive quarterly payout. Disclaimer: This article was written for informational purposes only, and isn’t intended as personal investment advice. Please practice due diligence before investing in any investment vehicle mentioned in this article.